Kaddis A Meg Nem Szuletett Gyermekert (Kaddish For A Child Not Born). First Hungarian edition of Kertesz’s mesmerizing novel of identity and memory. Octavo, original boards. Signed by Imre Kertesz on the title page. Fine in a fine dust jacket. 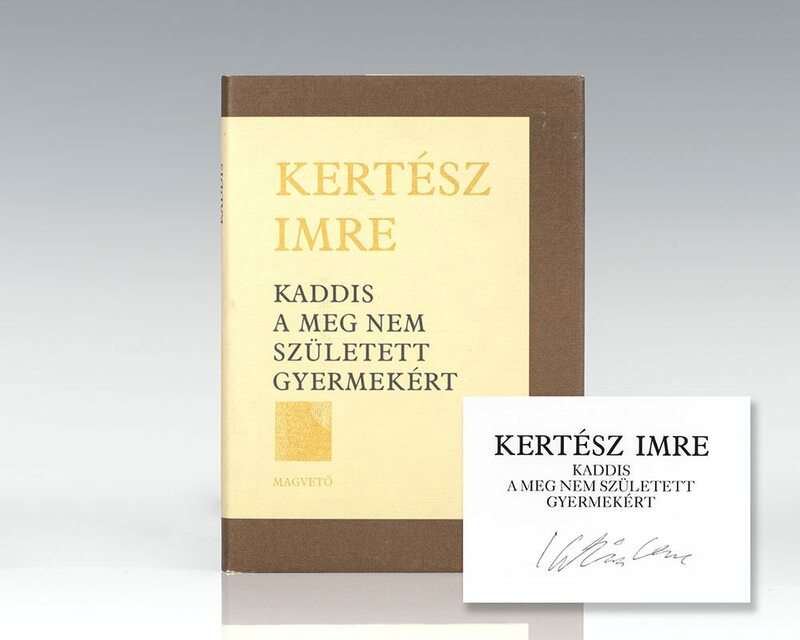 Imre Kertész won the 2000 Welt-Literaturpreis and the 2002 Nobel Prize in Literature"for writing that upholds the fragile experience of the individual against the barbaric arbitrariness of history." Kaddish For A Child Not Born is a stunning recitation which ". . . resembles . . . other memorably declamatory fictions as . . . Dostoyevsky's Notes from the Underground. 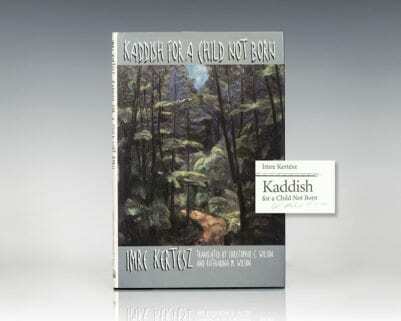 Yes, Kertesz's Kaddish is that good" (Kirkus). Kaddish For A Child Not Born. Evanston, Ill: Hydra Books/ Northwestern University Press, 1997. First edition of Kertesz’s mesmerizing novel of identity and memory. Octavo, original half cloth. Signed by Imre Kertesz on the title page. Fine in a fine dust jacket. Translated from the Hungarian by Christopher C. Wilson and Katharina M. Wilson. First Hungarian edition and true first. Octavo, original boards. Fine in a fine dust jacket. Signed by Imre Kertesz on the title page. 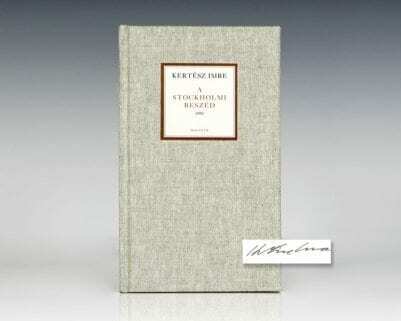 New York: Alfred A. Knopf, 2004. First edition of this novel by the 2002 Nobel Prize Laureate in Literature. Octavo, original half cloth. Signed by Imre Kertesz on the title page. Fine in a fine dust jacket. Translated by Tim Wilkinson. Jacket design by John Gall. 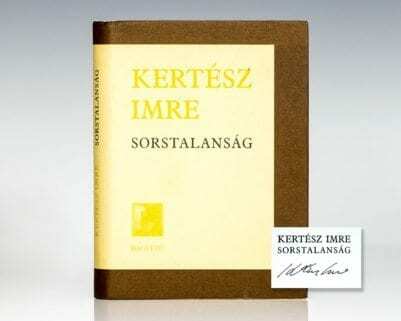 Second Hungarian edition of the Nobel Prize-winning author’s masterpiece. Small octavo, original cloth. Signed by Imre Kertesz on the title page. Fine in a near fine dust jacket with a touch of shelfwear. New York: Melville House, 2011. First edition in English of “an unforgettable novel” (Die Zeit). Octavo, original illustrated wrappers as issued. Signed by Imre Kertesz on the title page. In fine condition. Translated by Tim Wilkinson. New York: Seagull Books, 2011. First edition of Kertesz’s reflections regarding his experiences of the Holocaust and the Soviet occupation following the Second World War. Octavo, original half cloth. Signed by Imre Kertesz on the title page. Fine in a fine dust jacket. Translated by Thomas Cooper. Uncommon signed. First Hungarian edition, preceding the English edition. Octavo, original cloth. Signed by Imre Kertesz on the title page. Fine in a fine dust jacket. Second Hungarian edition published in 1985. Small octavo, original illustrated wrappers as issued. 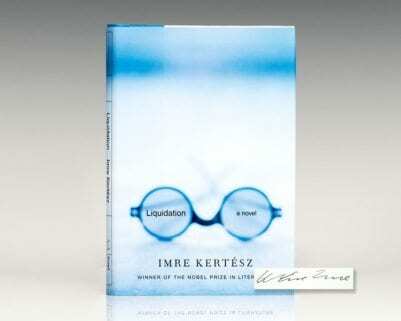 Warmly inscribed by Imre Kertesz on the title page. In near fine condition. A Stockholmi Beszed (Nobel Lecture). First edition of the author’s Nobel Speech. Small octavo, original cloth. Signed by Imre Kertesz on the title page. In fine condition. Uncommon. First edition of this riveting novel about a torturer for the secret police of a Latin American regime who tells the haunting story of the father and son he ensnared and destroyed. Octavo, original half cloth. Signed by Imre Kertesz on the title page. Translated from the Hungarian by Tim Wilkinson. Fine in a fine dust jacket. Jacket design by John Gall. First Hungarian edition of the Nobel Prize-winning author’s masterpiece. Small octavo, original cloth. Signed by Imre Kertesz on the title page. Also, laid in is an original pamphlet on this work, which is also signed by Kertesz. Fine in a near fine dust jacket with a touch of shelfwear. Rare and desirable signed.